As of today, September 12th, it’s been 5 years since Arma 3 officially released out of Steam Early Access. Naturally, that calls for a celebration! A lot can happen over a period of 5 years. And, looking back, that’s certainly been the case with Arma 3. As a result of more than 70 platform updates, Arma 3 has become a very different animal compared to the original 1.0 version. There have been tons of tweaks and additions. Many of those have been so profound that now we couldn’t imagine living without, such as the 3D Scenario Editor. 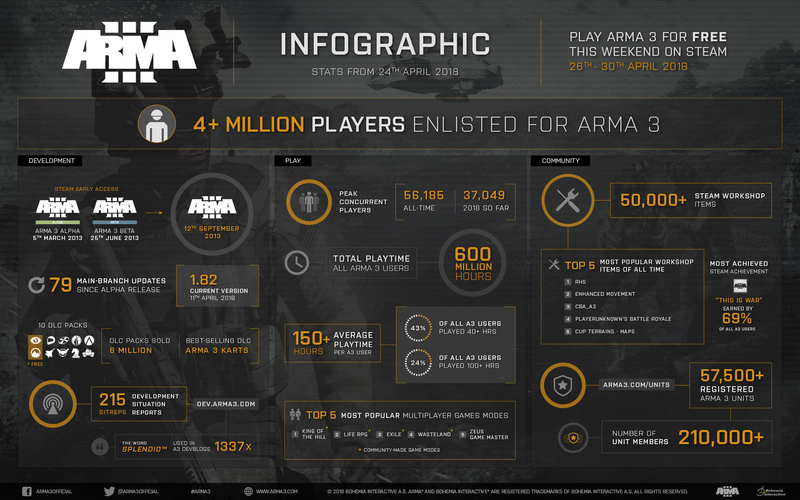 During its fourth anniversary, we shared a retrospective that charted our adventure until then, and earlier this year we posted an infographic with some of Arma 3's achievements and most impressive stats. For today’s milestone, we’ve prepared a timeline video that covers each of our key release milestones thus far. Click on the play button below for a quick trip down memory lane! But that’s not all. Since Arma 3 has played such a major role in many of our lives these past five years, we wanted to create some unique physical memorabilia. 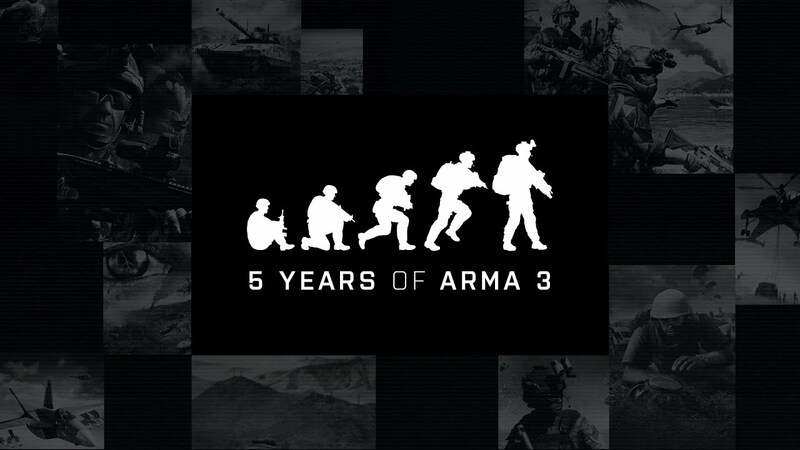 Starting today, the Bohemia Store offers a limited number of 5 Years of Arma 3 Collector’s Packs. These are composed of true collector’s items: a hoodie, a soldier's salute laser crystal, and a printed map of Altis. Additionally, we have a special t-shirt on sale. Find out more at https://store.bistudio.com/category/arma3-anniversary and get these items now while stock lasts. For those who have not yet enlisted or have yet to pick up some of the DLC packs, we’re also hosting a special anniversary sale on Steam and the Bohemia Store, starting from September 12 (10 AM PDT/7 PM CEST) until September 17 (10 AM PDT/7 PM CEST). You can get the Arma 3 base game and many of its DLC, including the Arma 3 Apex expansion, at up to 66% off. Reaping the benefits from 5+ years of post-release development, and with new content and updates still on the way, now is as good a time as any to jump into one of PC’s must-have military games. Finally, we know that as the game has evolved, most of everyone’s personal lives evolved, too. Since 2013, you might have finished your studies or started a new job. You may have moved to a new place and made some new friends. Perhaps you even got married and/or had kids. Or you've experienced some other defining life events. It makes it extra amazing to realize that, throughout all this, Arma 3 has remained such a bustling platform with one of the most loyal communities in gaming. You’re the absolute best of the best. Thank you for these 5 splendid years of Arma <3. Here’s to many more!